American food is not always easy to define, especially when you live in New York, where ethnic restaurants and fusion cuisine arguably reign. I guess at first I think of diner food–omelets and grilled cheese and French fries–but aren’t those of French descent? Croque Monsieurs and frites must be in their culinary family tree. Hamburgers and hotdogs, perhaps, but aren’t those from Germany? On my recent trip to Mississippi, I wondered if I’d gotten closer to some kind of American food, but with the barbecue sandwiches came Delta tamales. I think those hail from Mexico. Of course we’re historically a colony, and currently a melting pot, and so it makes sense that so many types of cuisines should have made their way into our diets and cooking habits. The most interesting question, perhaps, is how. And that’s why I’ve loved James Beard’s cookbook American Cookery since I first got my hands on it. 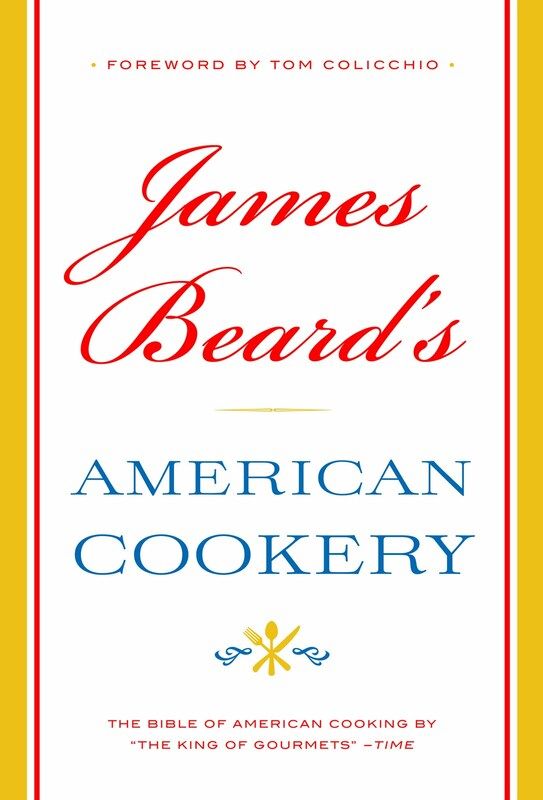 In it, James Beard covers American food as it was defined in the 1970s, and pretty much all of the recipes have backstories. He cites recipes from various home cooks and authors, as well as from community groups that published recipe pamphlets. A delicious history lesson ensues. When we were contacted by Little, Brown and Company (the book’s publisher, not to mention my one-time employers) about the republication of this fantastic, inspiring tome, we immediately counted ourselves into the blogger project: picking a recipe, cooking it, and contributing it to the James Beard Foundation Blog. The book has always inspired me to experiment. When you see the trajectory of a dish, you know where tweaks have already been made. I tried my best not to do so for the chicken pot pie I chose to make, but of course I wound up adapting it slightly, so it better fit the dimensions of my life. I used milk instead of cream, sliced onion instead of individual mini ones, sage instead of parsley. Honestly, I wasn’t sure how I’d feel about such an old-fashioned dish–chicken pot pie is not something I eat often–but I loved every bite of this. I have to say that it made a great lunch; I ate it for several days running and didn’t get bored. Not a bad dish to have in the fridge! So check out the new edition of American Cookery, and see what other bloggers have been cooking from it. In the meantime, we’ll be eating American food. Thanksgiving approaches, and if sweet potatoes with brown sugar and apple pie aren’t American, then I am truly lost. In the introduction to the Chicken Pie section, James Beard notes that for best results you should have both the crust and the chicken mixture at a cold temperature to achieve a more unified dish. He also instructs you to eat chicken pies as soon as possible after baking. I also found that they reheated beautifully in the microwave, though the crust loses a bit of its crispiness. *I used a standard pie crust that I like, and that’s pretty easy to roll out. The recipe follows the chicken instructions, but feel free to sub any pastry you prefer. Poach the chicken and allow to cool. Reserve the broth. Cook the vegetables until just tender in some of the chicken broth, seasoned with garlic and parsley. Melt the butter in a saucepan or skillet, blend with the flour, and cook several minutes. Gradually stir in 1 cup of the broth and continue stirring till the mixture thickens. Cool slightly, stir in the cream, and season with salt, pepper, and Tobasco. Cut the meat from the breast, legs, and thighs into substantial pieces. Add smaller bits of chicken to the sauce. Place the large pieces in a 1 1/2-quart baking dish. Set a cup in the middle to hold up the crust [I have to admit to not doing this]. Arrange the onions and carrots over the chicken and pour the sauce over all. Allow the mixture to cool thoroughly. Prepare the pastry and roll out to fit the baking dish with about 1 1/2 inches overlap. Roll up the edges and crimp with the tines of a fork to make it adhere to the top of the baking dish. If there is any pastry left over, cut decoration in the shape of small leaves or flowers and attache to the top crust with a little water. Make a vent in the center of the pastry to allow steam to escape. Brush the pastry well with the cream and egg yolk mixture. Bake 15 minutes in a 450-degree oven. Redue the heat to 350 degrees and continue baking til the crust is nicely browned and cooked through, about 35 minutes. Serve with either a green vegetable, such as peas or snap beans, or a salad. Combine the flour, salt, and sugar in a food processor. Pulse to combine. Add the cold butter and pulse again, just until the whole mixture resembles crumbs. Add the egg yolk and process until a ball comes together. If it hasn’t completely come together, slowly add 1-2 tablespoons of water, processing as you go so as not to add too much. Gather the dough and form it into a ball, then press it into a disk. Refrigerate for at least an hour before rolling out on a floured surface. Bravo for the idea of sage instead of parsley! I tend to skip bechamel in a pot pie – though the chicken broth is thickened with flour, which is sort of the same idea. It’s a great recipe! Actually, bechamel isn’t standard in pot pie recipes. Veloute is standard: stock thickened with roux (basically bechamel, but using stock instead). What Beard has used in his recipe is a derivative of veloute called sauce supreme: veloute finished with cream. I’m making this tomorrow. Adding white mushrooms. I like that it’s relatively simple. 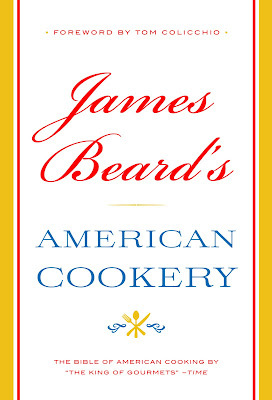 James Beard’s American Cookery is my most used cookbook. I’m now onto my second copy, and may need to replace it once more. Well, my goodness…you have my sister’s name and a recipe from the love of my culinary life! I have almost all of James Beard’s books and love reading them and seeing the food through his eyes. So, of course I had to subscribe to your newsletter! Can’t wait to try this version of the pot pie! You’ve got a sister named Cara? Love it! Welcome! So he advocated for baking the pie WITH the cup inside? What kind of cup are we talkin’? Yes! I think a ceramic mug would work best.